On Sunday, Oct 14, at 4:15 p.m., LBPD officers were dispatched to the 600 block of Sleepy Hollow Lane, at Sleepy Hollow Beach, for an intoxicated male on the beach allegedly harassing other beachgoers. Kyle James Blaker, 33, of Hawaii, was arrested for felony parole violation, disorderly conduct related to alcohol, and resisting arrest. “Blaker was a challenge to get back to the police vehicles because he was unstable on his feet due to his intoxication level,” Sgt Cota said. “Officers also learned that Blaker was on parole so the charge of a parole violation was added. Leis was contacted and taken into custody for a $10,000 drug related warrant. According to Stu News Laguna records, Leis has been arrested 7 times by LBPD since May 1, 2018. City Community Information Officer Cassie Walder explained there is a daily effort by the City’s Code Enforcement Division to monitor public property in the City and remove campaign signs that are placed on public property. Public property includes parks, medians, and the public right of way. Campaign signs posted on private property are allowed with the permission of the property owner. The theft or destruction of campaign signs is a crime and will be prosecuted. Congratulations are in order for LBPD Spokesperson PIO Sgt Jim Cota, who completed the Sherman Block Supervisor Leadership Institute (SLI) program this week. Over the last eight months, Sgt Cota learned about the various qualities that encompass a strong leader. He was tasked with reading numerous books and completed countless assignments in order to sharpen his leadership qualities. SLI is an intensive leadership development program that is designed to stimulate personal growth, leadership, and ethical decision-making for California law enforcement front line supervisors. LBPD lauds Sgt Cota for his ongoing efforts to bring excellence in every area to the community. Join LBPD on Thursday, Oct 25, from 5:30 to 7:30 p.m., for LBPD’s first Pizza with a Cop event at zpizza, at 30822 Coast Hwy. On Friday, Oct 12, at 10:15 p.m., LBPD officers and LBFD were dispatched to a rollover traffic collision on Laguna Canyon Road and SR 73 south, involving three vehicles and resulting in injuries. “A Mitsubishi Lancer occupied with three males was traveling south on Laguna Canyon Road. The roadway was wet and the vehicle lost control and struck an Edison support pole. The pole was severed and landed across the roadway. The Mitsubishi rolled over and came to rest on its roof. The driver sustained a head injury and was transported to Mission Hospital Mission Viejo,” said LBPD Emergency Operations Coordinator Jordan Villwock. An Audi Q5 occupied with four females was traveling behind the Mitsubishi and struck the downed pole. The Audi sustained front end damage. All four passengers were uninjured. Causing a chain reaction, a Nissan 300ZX occupied with one male was traveling behind the Audi and also struck the pole. The driver of the Nissan complained of neck and back pain and was transported to Mission Hospital Mission Viejo. Laguna Canyon Road was closed between El Toro Road and SR 73 in both directions for approximately two hours. A Nixle Alert and Sigalert were issued. Edison responded and de-energized the electrical lines which caused power to be lost in the Club Laguna area for approximately four hours. On Saturday, Oct 13, at 3:17 p.m., LBPD and LBFD personnel responded to 1400 N Coast Highway for an injury traffic collision involving a black Jeep hitting a silver VW, allegedly while intoxicated, causing bodily injury. Wyatt Edmond Hume, 25, of Laguna Niguel, was arrested on suspicion of DUI with bodily injury and driving with a blood alcohol content of 0.08% or higher. On Wednesday, Oct 10, at 5:42 p.m., LBPD officers were dispatched to Ocean Avenue, near Laguna Drug, in reference to a male subject allegedly exposing himself to passersby. Brian Keith Michael O’Connor, 56, of Laguna Beach, was arrested for indecent exposure and transported to OCJ. On Saturday, Oct 13, at 2:39 a.m., LBPD conducted a traffic stop in the 900 block of Laguna Canyon Road on a 2007 BMW. During the stop numerous washed checks, identification belonging to others, and what appeared to be a large quantity of stolen mail from Riverside were found. The driver and passenger, Theresa Grace Delgado, 23, of Victorville, and Charles M. Finneran, 31, of San Bernardino, were arrested for identity theft. Bail was set at $500 each. On Wednesday, Oct 3, LBPD officers conducted a traffic stop on Coast Highway near Cleo Street, at 11:12 p.m. The vehicle was occupied by six subjects. During the course of the investigation, officers located 40 fraudulent credit cards. On Monday, Oct 8, at 7:18 a.m., an LBPD officer was driving inbound on Laguna Canyon Road from the Toll Road (73) in heavy traffic when a motorcycle passed him on the left and to the left of the double yellow lane lines. “When he reached the intersection of El Toro he turned completely on his seat looked directly at the officer and pulled into the bike lane and started to accelerate,” continued Sgt Cota. Additional LBPD officers arrived as well LBFD. The motorcyclist was treated at the scene. According to police reports, he complained that his neck hurt after the spill. Charles Chayachok Laitipaya, 23, of Riverside, was taken into custody for evading a police officer and reckless driving. He was booked and later released. Laguna Beach students walked to school with parents, friends, LBUDS teachers, staffers, and LBPD officers during National Walk to School Day on Wednesday, Oct 3. LBPD posted several Instagram pictures walking with students, some carrying “Walk to School” signs. Led by LBPD School Resource Officer Cpl Cornelius Ashton, our students and officers were all smiles. He was proudly sporting a badge of his own, a “Walk to School Award,” button. Reportedly over 50 OC Schools participated in National Walk to School day. Keep it going! Besides National Walk to School Day, on Wednesday, Oct 3, LBHS students got a sweet treat from LBPD at the “Cookies with a Cop” event at LBHS. LBPD officers provided cookies and conversations with students and faculty. LBPD posted on Facebook that the Laguna Beach Animal Shelter is in need of donated newspapers for the animals. If you’d like to help, please drop off any unwanted newspapers between the hours of 11 a.m. and 4 p.m. at the animal shelter located at 20612 Laguna Canyon Road. The animal shelter is open seven days a week. For information, call (949) 497-3552 or visit www.puplagunabeach.org. On Wednesday, Oct 3, at 9:25 p.m., at Cleo Street and South Coast Highway, LBPD officers were dispatched for an assault that had reportedly just occurred involving a man hitting another man. A description of the suspect was given and dispatch advised the suspect had gone into the underground parking lot at a local hotel. He was described as a white male with light hair, a medium build, with tattoos on his arms, and wearing a light color short sleeve shirt. The victim was desirous of prosecution and Nicholas Tyler Lilley, 27, of Laguna Beach, was arrested for battery. The victim is a resident of Santa Ana. “Yes, the attack was unprovoked and occurred at a bus bench,” Sgt Cota added. On Friday, Oct 5 at 1:49 a.m., at the 300 block of Glenneyre Street, LBPD officers responded to the City Library in reference to a man allegedly exposing himself by mooning the reporting party. After that, the suspect reportedly went into the garden area outside the library and started pulling apart plants. Brian Keith Michael O’Connor, 56, of Laguna Beach, was arrested for arson. “O’Conner is homeless and claims an address of the ASL,” Sgt Cota added. On Saturday, Oct 6 at 1:25 p.m., LBPD officers responded to the 100 block of Thalia Street for a squatter inside a vacant residence. The trespasser was reported by a real estate agent, who had video of the intruder and contacted the homeowner. The homeowner was desirous of prosecution and signed a private person arrest form. Robert Oxier, 36, with no known residence, was placed under arrest for trespassing and later released. On Wednesday, Oct 3 at 7:39 p.m., at the 3000 block of Dorn Court, LBPD officers responded to a residence in reference to a domestic violence investigation. At the time of the call, the reporting party said they were now in separate rooms. She was in the bedroom and he was in the kitchen. Damon Harold Roberts, 59, of Laguna Beach, was taken into custody for misdemeanor domestic battery. According to Sgt Cota, Roberts allegedly pushed the 71-year-old alleged victim and poked her in the face. On Tuesday, Oct 2, at 8:12 a.m., LBPD officers responded to reports of a suspicious subject on Alta Laguna Blvd, who was frightening the local residents with his bizarre behavior. According to the LBPD log, the suspicious person was seen roaming the perimeter of the school at 1:58 p.m. peeking through the bushes at TOW. The suspect was described as a bald male with a mohawk wearing a football sports jersey. He was warned not to come onto the grounds of the school’s campus or he would be arrested. On Tuesday, Oct 2, at 4:42 p.m., at the 600 block of N Coast Hwy, LBPD officers responded to a male subject smelling of alcohol standing at the entrance of Pavilions refusing to leave. According to police records, the subject was described as a thin, white male approximately 20 years old, wearing white and driving a white Range Rover. Because of his condition, a taxi was requested to drive the subject to his home in the Temple Hills area. 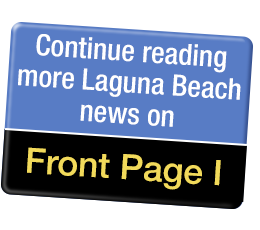 In response to a Stu News inquiry, noting an apparent increase in LBPD records of individuals reportedly camping on the beach at night, particularly around Main Beach and Crystal Cove, LBPD Chief Laura Farinella clarifies the ordinance in Laguna Beach. In Tuesday’s edition of Stu News, there were several reports of rattlesnakes inside homes and too close for comfort on porches, on the stairs, and undesired locations that concerned some of our readers. So, we turned to our local expert, LBPD Civilian Services Administrator Jim Beres to keep our loyal peeps apprised of the snake situation of rampant rattlers here in Laguna. As reported on Wednesday, Sept 26, there were two scary incidents of rattlers found inside two local buildings just 11 minutes apart. One snake was spotted at the 20500 block of Sun Valley Drive, where a person reported that a rattlesnake was in their home in their living room. “The rattlesnake was behind an entertainment center in the living room of the resident’s home. It is unknown how the rattlesnake got in, possibly through an open door. An animal services officer responded, caught the rattlesnake, and relocated the snake to a wilderness area in Laguna Canyon,” Beres explained. Also, on that same day, one of the other more frightful findings was a rattler found in a restroom. And even worse the reckless rattler was located at one of our schools. Please be cautious because there are too many snakes sneaking around in town. If you find one, make sure to report it to LBPD. On Sunday, Sept 30, at 6:53 a.m., LBPD officers responded to the US Post Office at 31677 Virginia Way for two “transient looking subjects” inside the lobby rolling around under the table. New Hampshire resident Michael Flaherty, 22, was arrested on his warrants. The second subject was advised against further trespassing. On Wednesday, Sept 26, at 11:27 a.m., LBPD officers were dispatched to the 1600 block of Arroyo Drive for a report of possible drug dealing. According to log reports, the two suspects were inside of a vehicle parked outside of a residence for about 40 minutes. Officers arrived and located three subjects inside of the vehicle, described to be a white sedan. “They all made furtive movements as the officers approached; therefore, they detained them for further investigation. Upon searching the subjects and the vehicle, officers discovered a sizeable quantity of drugs, heroin and methamphetamine, as well as a large amount of cash in various denominations belonging to the driver, Corey Aaron Reed, 36, of Garden Grove,” Sgt Cota said. Reed was placed under arrest for possession of a controlled substance for sale, a felony. Rattlesnakes seem to be on a home invasion spree. This week, there were two incidents of rattlesnakes being reported inside residents’ homes and several sightings too close for comfort. On Wednesday, Sept 26, there were two scary incidents of rattlers found inside two local residences just 11 minutes apart. At 4:12 p.m., at the 20500 block of Sun Valley Drive, a person reported that a rattlesnake was in their home under a chair in their living room. A little over 10 minutes later, at 4:23 p.m., at the 8600 block of Coast Hwy, a rattlesnake was discovered in a resident’s bathroom. Also, on Wednesday, a rattlesnake, possibly identified as a diamond-head rattler, was reported in a person’s side porch at 5:43 p.m. at the 0 block of Pacific Vista. Then, on Thursday, Sept 27, at 3:49 p.m., at the 1300 block of Morningside Drive, a person called to report a baby rattlesnake on their front steps. And on Friday, Sept 28, at 12:51 p.m., at the 3200 block of Alta Laguna Blvd, a rattlesnake was reported near the entrance of a resident’s home. Please be careful and make sure to contact LBPD if you find a rattlesnake in or near your home. On Monday, Sept 24 at 3:16 a.m., at Surf & Sand Hotel, a caller reported to LBPD that his friend had knocked him out and that he was bleeding from the face. According to log reports, the caller had tried to get his credit card out of the room, which angered his friend because he was entertaining female guests and didn’t want to be interrupted. “When officers arrived to investigate, the suspect fled on foot by jumping off the balcony onto the sand,” LBPD Spokesperson PIO Sgt Jim Cota said. A taxi driver who was at the hotel recognized the suspect and later saw the suspect at the Chevron at SR-1 Coast Hwy and Crown Valley, but responding officers were unable to locate the suspect at the time, Sgt Cota said. At about 7 a.m., LBPD officers and detectives began surveillance near the hotel and the suspect was taken into custody at about 8:50 a.m. in front of the Surf & Sand. Bakersfield resident Jeremy Scott Bell, 33, was arrested for felony burglary second degree, battery, and using stolen credit cards. “Bell was positively identified and was on probation. He was charged with several fraud related crimes and burglary,” Sgt Cota said. On Tuesday, Sept 25 at 7:55 a.m., at the 200 block of Broadway Street, a man, who was also the alleged victim, came to the LBPD station to report an alleged assault that had just occurred. According to the alleged victim, he was in Whole Foods when he saw someone he thought looked like the talk show host Montel Williams. He walked up to the man and told him what he thought. Obviously not flattered, the suspect allegedly punched him in the ear and fled. Bail was set at $15,500. On Wednesday, Sept 19 at 11:24 a.m., an LBPD officer met with a Merritt Farms employee who manages several properties in Laguna Beach, including at the 600 block of South Coast Highway, a vacant lot where the scene of the missing palm tree occurred. According to police reports, the employee said the disappearance of the tree happened sometime between 2:30 and 6:30 p.m. that day. According to the witness, “An unknown subject removed a planted palm tree from the rear of the lot that was approximately 6-feet tall and 2.5-feet in diameter. The exact value of the mature rooted tree was unknown, but was estimated to be around $2,000. LBPD invites Laguna locals to join together with neighbors and police officers for coffee and conversation on National Coffee with a Cop Day on Wednesday, Oct 3. LBPD will host a morning and evening event for National Coffee with a Cop Day. The first event will be held at Peet’s Coffee located at Gelson’s Market, at 30922 S Coast Hwy, between 7:30 and 9:30 a.m. The second event will be held at Starbucks at 180 N Coast Hwy, from 6 to 8 p.m.
On Saturday, Sept 22, at 9:32 a.m., LBPD and LBFD responded to an injury traffic collision involving a pedestrian and hit and run vehicle at Beach Street and Broadway Street. The person who reported the incident said they didn’t see the vehicle but heard it prior to seeing the victim down. When the officers arrived, a woman was located sitting on a planter near the traffic collision scene with serious injuries. “It appeared she had a broken left arm and a large laceration to her neck,” said LBPD Spokesperson PIO Sgt Jim Cota. “The responding officers did a good job working with local businesses and using the city cameras to identify the suspect and his vehicle,” Sgt Cota said. According to LBPD police records, Burger was arrested on suspicion of DUI at 12:11 a.m. at Forest Ave and Beach Street. Bail was set at $50,000 for the felony hit and run and $2,500 for the suspicion of DUI. On Saturday, Sept 22, at 4:57 p.m., an LBPD officer was dispatched to the Pavilions parking lot, at the 600 block of N Coast Hwy, in reference to grand theft of a dog from a vehicle. An LB Animal Services Officer arrived prior to the PD officer and contacted the victim. The victim parked her Prius near the back of the lot. According to the victim, she left her window lowered a few inches, doors locked, and her small young dog, Joey, inside, while she went into Pavilions for approximately 10 minutes. Joey is described as an 11-month-old blue merle toy Australian Shepherd. He is microchipped. The pup’s parent said she paid $1,500 for Joey, but he’s priceless. According to dog experts, the toy is the smallest version of the Australian Shepherd, standing between 10 to 14-inches tall at the shoulder when full-grown and weighing between 12 and 17 pounds. Although he’s small, the toy version has all the herding instincts of his larger relatives. There are no additional leads or suspects at this time. Keep a watch out for Joey and please call LBPD at (949) 497-0701 with any information or leads. On Tuesday, Sept 18, at 7:35 a.m., an LBPD officer was flagged down in the area of Cliff Drive and Aster Street by several citizens reporting that a man, later identified as James Eugene Leis, was running up and down the street hitting cars. Leis, 28, of Laguna Beach, was detained and his probation officer was contacted who placed a “flash hold” warrant on him. He was arrested and transported to Orange County Jail. According to Stu News Laguna records, Since May 1, 2018, Leis has been arrested six times by LBPD. On Monday, Sept 17, at 4:04 p.m., at the 100 block of S Coast Hwy, LBPD officers responded to the Main Beach area in reference to an assault report. Officers contacted Shane Hardin, who was one of the involved parties, and upon a consensual search located two white capsule shaped pills in his right front pocket. Hardin signed the citation in LBPD’s presence and was released at the scene on his written promise to appear. Officers met with the other party, who alleged Hardin threw water at him. He indicated he was not desirous of prosecution and only wanted Hardin advised not to further disturb him. Shane Christopher Hardin, 43, of Laguna Beach, was arrested for being in possession of a narcotic controlled substance. LBPD gives their three newest employees a warm welcome – Jailer Devon James, Officer James Denevan, and Officer Kylan Peterson – and would like the community to welcome them too, as a part of America’s finest in blue. James previously worked for the Los Angeles County Probation Department. He grew up in Long Beach, and attended Millikan High School, where he played basketball. An avid sports fan, James enjoys watching basketball, baseball, and football, actually he enjoys all sports. Officer Kylan Peterson is also a new asset to LBPD. Peterson is from Downey, and graduated from St John Bosco High School in Bellflower. He attended Long Beach City College and Cal State Dominguez and received his B.S. degree in Business. Peterson loves all sports, including Fantasy Football and dirt biking. He is married to Meagan Kylan and has a 1.5-year-old baby boy named Carter. Officer James Denevan is also a welcome addition. Denevan grew up in Cypress where he graduated from Cypress High School. He then attended Cal State Long Beach and received his B.A. in Criminal Justice. In his spare time, Denevan likes to ride dirt bikes. Denevan is happy to be in Laguna Beach. On Friday, Sept 14, at 8:04 a.m., LB Lifeguards received a 911 call about a single scuba diver face down in the water at Crescent Bay Beach. The patrol unit was on scene in three minutes at 8:07 a.m., according to LB Marine Safety Capt Kai Bond. “A single scuba diver was pulled out by a good Samaritan, an adult male with scuba equipment. Lifeguards performed CPR on scene at Crescent Bay Beach, but he was unresponsive,” Capt Bond said. The adult male was then taken to Mission Hospital in Mission Viejo by paramedics. His condition is unknown. The surf has been rough and there have been a number of drowning events in the last couple of weeks. Capt Bond said the surf conditions have been pretty significant with 3 to 5 feet swells and yellow flag conditions. Important safety tips for people who want to go out into the ocean: learn to swim; swim by an open lifeguard tower; swim with a buddy; always check with the tower lifeguard to get up-to-date conditions; learn about rip current safety; and always go into the water feet first, Capt Bond said. For this past weekend, on Saturday, Sept 15 and Sunday, Sept 16, there were 274 rescues, 42 medical aids, 4,454 public contacts, and 2,425 prevents. This summer, from June 23 to Labor Day, Marine Safety had 5,265 rescues, made 323,861 public contacts, and prevented 166,558 beachgoers. On Saturday, Sept 15, at 7:09 p.m., an LBPD officer conducted a traffic stop on a vehicle driven near Calliope Street and S Coast Hwy. The officer advised the vehicle continued travelling southbound and requested an additional unit respond. Prior to entering jail, Herndon reportedly advised he had methamphetamine hidden between his buttocks. Further investigation revealed he was selling methamphetamine, according to Villwock. Ronald Gene Herndon, 53, of Laguna Beach, was also charged with felony transport of a controlled substance and felony possession of a controlled substance for sale. Orange County Probation was contacted and he was placed on a probation hold. According to Villwock, LBFD supplied Advanced Life Support and transported the 75-year old man to a local area hospital. When he arrived at the hospital, he was breathing on his own and talking to first responders. “LBFD Fire Captain/Paramedic Robert Abijay attributed the life-saving actions to what officer McGuire and BPO Flagstad did with early CPR and AED usage,” said Villwock. LBPD later learned that the 75-year-old man they saved at Shaw’s Cove was celebrating his granddaughter’s engagement with family at the beach at the time of his heart attack and rescue. Hopefully, thanks to LBPD heroics, he will soon be able to continue the celebration. On Friday, Sept 14, at 3:59 p.m., at the 600 block of Sleepy Hollow Lane, Laguna Beach Emergency Services, including Marine Safety, received a 911 call reporting three subjects in the water at Sleepy Hollow Beach. The reporting party said they were approximately 100 feet offshore at Sleepy Hollow Beach. Capt Bond said two of the three patients were transported to Mission Hospital Laguna Beach. One was not a medical aid, but the other two were transported. “The patient information is not known at this time,” Capt Bond said. Eye witness Brynne Van Putten, who is a local, described the scene as she was walking her dog down the steps at Laguna Surf at the time of the incident. At the beach, she saw a group of about 10 girls, approximately 16-years-old, and a few people scattered around the beach. She noticed that there were only two surfers in the water. She said she was trying to call the lifeguards, but that they were all at Main Beach. But in the meantime, this kid was starting to go down, she said. At this point the lifeguards came running down, Van Putten said. As another friend staggered out of the surf, his friends went out to the white water and grabbed him. He just collapsed on the beach. One of the kids started getting sick and they were put on stretchers and taken to the hospital. She said the kids were all from Santa Ana and told her that the boy that almost drowned got swept all the way down from Main Beach. “If Michael hadn’t gotten to that kid when he did, he definitely would have drowned or he definitely would have been under,” Van Putten said. The good Samaritan, surfer Michael Cipolletti, from Laguna Niguel, was the true hero, Van Putten added. On Wednesday, Sept at 2:29 p.m., LBPD officers responded to Ralphs at the 700 block of S Coast Hwy in reference to a petty theft of alcohol. According to reports, Ensley took off from Ralphs on his skateboard with the loot d’liquor stashed in his black backpack. According to police records, an officer said, “I located a strawberry Mike’s Lemonade with the subject and the can is still kinda cold.” The other chilled swill located on his person was a Hurricane Malt. Brian Scott Ensley, 40, of Laguna Beach, was placed under arrest for petty theft and felony violation of probation.